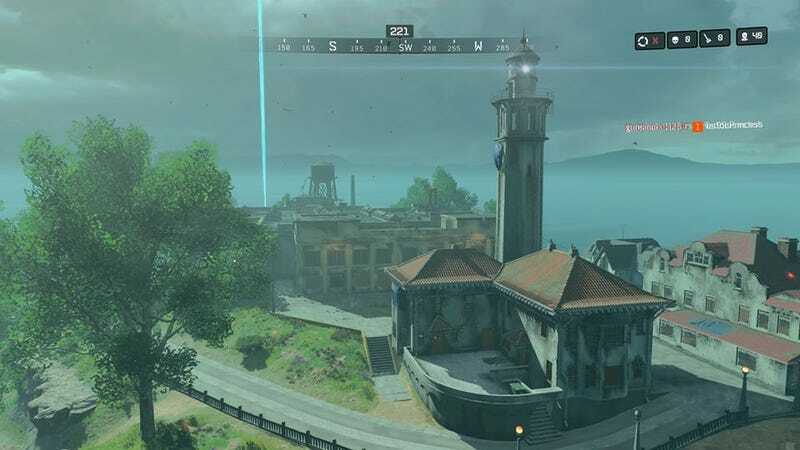 Alcatraz Island has arrived in Call of Duty: Black Ops 4. It’s based on a Zombies map, but this version is for the Blackout battle royale mode. You wouldn’t think it, but the smaller map makes for an intense, close-quarters battle royale experience. Alcatraz, a free map, is currently available on PlayStation 4, with Xbox One and PC to receive the content on April 9. This version of Alcatraz is a remastered revival of Black Ops 2’s Mob of the Dead prison, which we also see as Blood of the Dead in Black Ops 4’s Zombies. You’ll encounter zombies in the Blackout map too, but their locations seem pretty limited. I didn’t run into any undead in the buildings at the outskirts of the prison. It’s also a nice touch to see gun “wall buys,” guns hanging on the wall for the taking, much like the guns you would typically grab in a match of Zombies. Guns on the wall aren’t special and there’s tons of loot everywhere, but it’s nice to see an homage to Zombies. The “wall buys” don’t cost anything and they’re always in the same spots, so you could strategically drop down on a gun that’s a sure thing. These weapons also respawn every 30 seconds. Initially, I thought Alcatraz would feel too cramped with all the tight prison corridors and tunnels, but Treyarch opened up a lot of buildings outside the prison. Given the size of Alcatraz Island, there are a surprising number of places to land, and many points offer verticality with some high rooftops and a lighthouse. Alcatraz is only available in Quads mode, and has a 40-player cap, so other players aren’t dropping all over you at the start of the match. However, dead players can redeploy after 30 seconds with up to five respawns, assuming someone in their squad is still alive. I think redeploy was the right call for this smaller map; limiting the player count and implementing the redeploy feature allows the matches to keep the action going without being overwhelming for the map size. The Nova Gas circle is more ominous now in such close quarters, and the collapse feels faster than traditional Blackout. Much like Al Capone, I’m enjoying my time at Alcatraz. Hopefully, we’ll see solo and duo matches added at some point. I love seeing map variety, and with some thoughtful redesign, Treyarch proves a Zombies map can work for battle royale. There’s also a free access promotion for Blackout, running from now until April 30 on PlayStation 4, Xbox One, and PC. If you don’t own Black Ops 4 yet, this might be a great time to try the battle royale. Anyone can download the free demo and play Blackout.